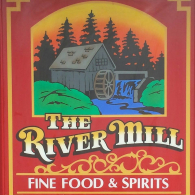 When you're looking for great food, spirits and fun, be sure you stop by The River Mill! Whether you're traveling by automobile, snowmobile, ATV, or bike, The River Mill is easy to find. Just look for the big log building with the green roof. Best Team Name: Prizes start lower, but go up as the # of players grow. Mondays…Macaroni Mondays…specials on all our Mac & Cheeses.Thursdays – are B.O.B “Buck off Burgers baby”! That is right…One dollar off all single and double burgers all day long.Thursday Steak Night Specials on all steaks ... includes side and salad bar.Friday Night Fish Fry - Friday night is our Traditional Fish Fry night. Stop down and enjoy our mouth-watering Icelandic cod deep fried or broiled.Saturday Night Prime Rib - This amazing dish includes choice of side and salad bar! Every Sunday is “Sunday Funday” at The River Mill!Drink and food specials all day long and Happy Hour 2-5 pm. Join us during Packer Season where we are “Bringing the Tailgating Inside!” Food, Spirits, Raffles, and more!Remember to Like us on Facebook for upcoming events and specials!